The post ‘Lookahead Lines’: Dolphins Spread Moves Out to Key Number Hosting Bears, Who Were Idle Last Week on Bye appeared first on SportsHandle. Every week, Sports Handle will look at NFL lines, specifically “Lookahead Lines,” to see how they’re moving and why. Lookahead lines are those posted one week prior to a game or even before the season has begun, as CG Technology does. By comparing changes between current lines and the numbers hung days earlier, we can get a sense of where recency bias or overreactions are seeping in. The Bears come into Week 6 at 3-1 and atop the NFC North standings. Chicago was once 100/1 to win the Super Bowl this summer and are now down to 25/1 at the SuperBook. Last week the SuperBook had the Dolphins -1. That line was similar to the one CG Technology released in May at Miami -1.5. However, the line has gone up the Bears -3 and Chicago didn’t even play last week. While people’s perception of the Bears has changed since the season started, the Dolphins are going in the opposite direction. After starting the year 3-0, Miami has lost its last two games to the Patriots and Bengals by at least 10 points. 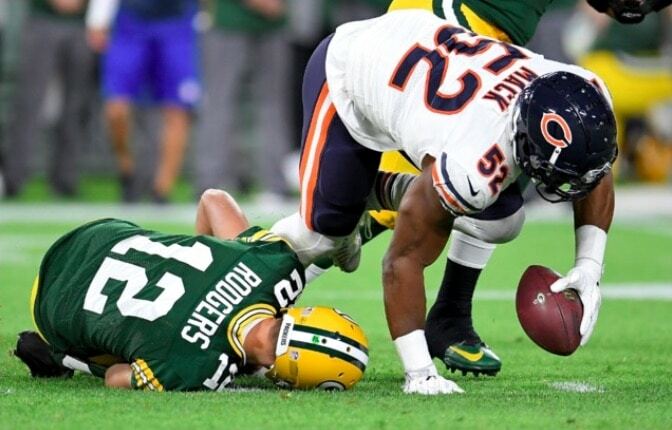 One thing to keep in mind is the Bears have only played one road game this year, a 16-14 win over the Cardinals. The Dolphins beat the Titans 27-20 and the Raiders 28-20 in their two home games. Miami is coming off a face-melting 27-17 loss to the Bengals after Cincinnati scored 24 fourth quarter points to win by 10, and cover 6.5. This movement spells some value on Miami as the 3-point home dog and especially if you grab an available hook. This game has seen the biggest line movement after the Falcons got blown out in Pittsburgh last week to drop to 1-4 on the season. The Buccaneers had a bye last week and will be making the switch to Jameis Winston at quarterback. CG Technology made the Falcons a touchdown favorite back in May. The SuperBook’s early number was similar with the Falcons -6.5 last week. After the Falcons got blown out by the Steelers 41-17 on Sunday, the SuperBook released the line at Atlanta -3.5 and it hasn’t moved off that number as of Wednesday. There could be some value taking the Falcons here, although they haven’t had much of a home field advantage this year, going 1-2 SU and ATS, and have hemorrhaged 43, 37 and 41 points in their past three contests. This game is being played in London and the Seahawks are seeing the line shift their way coming off a home loss to the Rams. The SuperBook made this game a pick ’em last week and then opened Seattle at -3. Even though the Seahawks are 2-3, the line says more about how bettors perceive the Raiders. The Jon Gruden era is off to a slow start with Oakland opening the season at 1-4. The Raiders have played three close game but they looked bad in a 26-10 blowout loss to the Chargers last week, while the Seahawks played well against the undefeated Rams, losing 33-31 as a 7-point underdog. The London games are always tough because theirs no home field edge. The Seahawks look to be a little overvalued when you consider they’re coming off an emotional loss and now have to travel to London. This number looks like it should be closer to the pick it was last week and the -3 is an overreaction to Sunday’s results. The Titans are leading the AFC South with a record of 3-2 and the Ravens are coming off a 12-9 loss to the Browns. Despite the Titans’ early season success, the line has gone towards the Ravens on the road. Last week, the SuperBook had Baltimore -1 on the early lines but even after the Ravens’ loss to the Browns, the number has gone to -3. CG Technology had the Titans a 2.5-point favorite back in May and it can be argued that after five games, Tennessee has exceeded expectations. The Titans are winning ugly and that kind of style typically doesn’t get the public excited. Tennessee has won both its home games by three points but a 13-12 loss in Buffalo last week is one reason the line went up to three. Losing to the Bills is one way to change the public’s perception of a team. Note that the Ravens are 1-2 both SU and ATS on the road this season. The Titans are worth a look as one of the most undervalued teams in the NFL, while the average Ravens tend to be overvalued right now. On The Pro Football Handle, Las Vegas-based sports talk voice Matt Perrault and veteran bookmaker Robert Walker of USBookmakingdive into select NFL games, line movements and bookmaker liabilities, plus greater sports betting topics and stories that may have nothing to do with football. Walker has seen it all behind the counter and Perrault the same from behind the microphone, so they’ll have you prepared for anything.